Here, in one eBook volume, are the first four books in the hugely acclaimed Martin Beck series – novels that shaped the future of Scandinavian crime fiction and influenced writers from Stieg Larsson to Jo Nesbo, Henning Mankell to Lars Kepplar. The first four novels in the Martin Beck series, available in one eBook volume. ‘Roseanna’: On a July afternoon, the body of a young woman is dredged from a lake in southern Sweden. Raped and murdered, she is naked, unmarked and carries no sign of her identity. As Detective Inspector Martin Beck slowly begins to make the connections that will bring her identity to light, he uncovers a series of crimes further reaching than he ever would have imagined and a killer far more dangerous. How much will Beck be prepared to risk to catch him? ‘The Man Who Went Up in Smoke’: A Swedish journalist has vanished without a trace in Budapest. When Detective Inspector Martin Beck arrives in the city to investigate, he is drawn to an Eastern European underworld in search of a man nobody knows. With the aid of the coolly efficient local police, he reveals a web of crime, stretching back across Europe – a discovery that will put his own life at risk. ‘The Man on the Balcony’: Someone is killing young girls in the once-peaceful parks of Stockholm – killing them after having his own way with them. The people of Stockholm are tense and fearful. Police Superintendent Martin Beck has two witnesses: a cold-blooded mugger who won’t say much and a three-year-old boy who can’t say much. The dedicated work of the police seems to be leading nowhere, and with each passing day the likelihood of another murder grows. But then Beck remembers someone – or something – he overheard. ‘The Laughing Policeman’: On a cold and rainy Stockholm night, nine bus riders are gunned down by an unknown assassin. The press, anxious for an explanation for the seemingly random crime, quickly dubs him a madman. But Martin Beck of the Homicide Squad suspects otherwise: this apparently motiveless killer has managed to target one of Beck’s best detectives – and he, surely, would not have been riding that lethal bus without a reason. 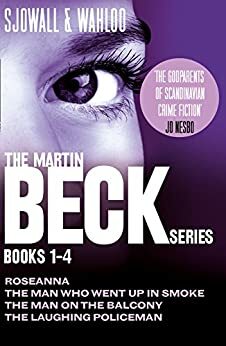 The main character, Martin Beck, is a Swedish detective. The stories are quite realistic, in the sense that Beck spends most of his time gathering information that doesn't help solve the case. He keeps plugging away, until he has enough data to see the key. Beck seems to be somewhat depressed most of the time. The stories tend to move slowly, by today's standards, but Beck is a really sympathetic character. This volume contains the first four books of the series. love murder mysteries, especially swedish ones!! !